When I was a kid, I was in awe over the large white castle on the beach, a hybrid of Spanish and Moorish style with tile roof and wondrous gardens. It was a strong focal point in Ensenada, dwarfing all other buildings in the post-World War II Baja village by the sea, and like most imposing structures, it was filled with history and intrigue. Our family used to camp down the beach a ways and I tried to imagine what the fancy hotel might look like inside. It had to be for rich people, I thought, as I remembered hearing that Hollywood stars used to frequent the place. I’d look for movie stars when we’d drive by, but I never saw any. Known today simply as the Riviera, the Hotel Playa Ensenada as it was known then, opened on Oct. 31, 1930, an elegant hotel with a gambling casino said to rival that of Monte Carlo’s. To help attract the Hollywood and international set to Ensenada, world famous heavyweight boxer Jack Dempsey, one of the most recognizable names on the planet at the time, became part of the developing corporation. A huge villa was even built for Dempsey, just to the south of the main building. It is rumored that gangster Al Capone was one of the corporation’s silent partners. Work began on the Riviera in 1928 by James L. Miller, contractor. The elaborate building’s architect was Gordon E. Mayer. And the inspiration was purely Hearst Castle, a similar-looking structure built earlier about 400 or so miles up the coast. During the early-1930s, the hotel flourished, and not only did the Hollywood crowd come but royalty as well. The opening act in the hotel ballroom was Bing Crosby who was accompanied by the Xavier Cugat Orchestra. A local Latin singer named Margarita Cansino, who would later find fame in Hollywood as Rita Hayworth, sang and danced at the Hotel Playa Ensenada. She and her father also entertained the tourists at the Agua Caliente Casino in Tijuana. Cars on Ensenada beach with Riviera in background. Circa 1930. When prohibition was finally repealed in the United States in 1933, attendance started waning as fun-seekers no longer had to leave the country. But the final death knell came five years after that when Mexico outlawed casino gambling in 1938. The place closed down. The beautiful building sat vacant until 1941 when it was used by the military. In 1942 a newly renamed Riviera del Pacifico reopened under the management of Jerome Hutley and Margarita Plant. But the hotel fell victim to the times, a white elephant that had lost its major attractions and never really took off. It closed its doors in 1948. While there were several openings and closings under the name Riviera del Pacifico, the huge building fell into disrepair. By the 1960s squatters had occupied the formerly opulent Dempsey Villa, by then windowless, doorless and stripped of furnishings. During the 1960s it floundered, and by the ‘70s a group that wanted to destroy the building had organized and if nothing else, caught people’s attention. The Mexican federal government stepped in and began restoration in 1978. A couple of years later the state of Baja California took over and completed the restoration. For the past 22 years the Riviera has become the Centro Cultural Riviera de Ensenada, in short the Riviera Cultural Center of Ensenada. And it is used by the people of Ensenada, dispensing knowledge and art and pride to a degree much more beneficial to a society than one-armed bandits fleecing touriws from another country. 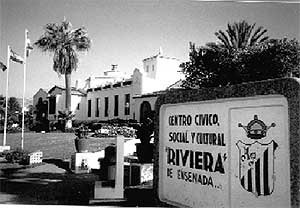 The people use the Riviera Cultural Center. Once while attending a Seafood Competition among the area’s restaurants, I wandered theThe Riviera Cultural Center of Ensenada ornate hallways, replete with inlaid tile, gorgeous chandeliers, painted ceilings and beautiful murals. The three courtyards with potted geraniums and bright billowing bougainvillea are refreshing and restful. The compact timeless Bar Andaluz off one courtyard is a hideaway respite. Nowadays the cruise ships that make Ensenada a port of call offer excursions to the Riviera, and tourists wander the courtyards looking for bargains among the displays of local artists and vendors. One wing of the Center has a library with textbooks, history books and novels. People studying or pouring over old books are seemingly always in evidence, and late one evening I noted a chess club had commandeered the library for some head-to-head matches. Above the library is the museum, el Museo de Historia de Ensenada, which features the history of Baja California and some of the finest photographs of the Baja missions I’ve ever seen. Open from 9 a.m. to 5 p.m., Tuesday through Sunday, the museum takes viewers from the indigenous peoples, through the conquest and colonization of Baja California. It’s small, but a wonderful exhibit and is well worth the minimal fee. The greater part of the building is reserved for weddings, parties and conventions. The Riviera has been home to both national and international conventions, bringing added importance to the former fishing village. There’s always some type of event happening at the Center. A recent visit showed posters for upcoming events: Fiesta Viva on Oct. 13-17; a concert featuring the Mexican soprano Ivette Perez Mazon; the Festival de Atun (Tuna Festival) on October 17 (Benefiting the Cancer Association of Baja California); a poet’s conference and a song festival. Much of the building is used for various classes. There’s classes for kids, and for adults on how to raise kids. Budding ballet stars and artists and folkloric dancers come and go all afternoon. Cars pull up to the side entrance dropping off children in tutus and regional dance costumes. An ongoing cultural tapestry is being painted at the Riviera these days. It turned out my dreams about the building for rich people were accurate. But the richness is far more substantial than the surface glitter for which it was originally intended. It took a while but the Riviera has realized its dreams of wealth, a vast richness of culture and art and history.